FP-90; premium portable digital piano from Roland utilising their flagship SuperNATURAL sound engine for incredible lifelike piano tones, se..
FP-90; premium portable digital piano from Roland utilising their flagship SuperNATURAL sound engine for incredible lifelike piano tones, seen here in a classy white finish. The Roland FP-90 digital piano features the incredible SuperNATURAL sound engine combined with a sleek, modern cabinet and a powerful multi-channel speaker system – perfect for live performance in smaller venues. 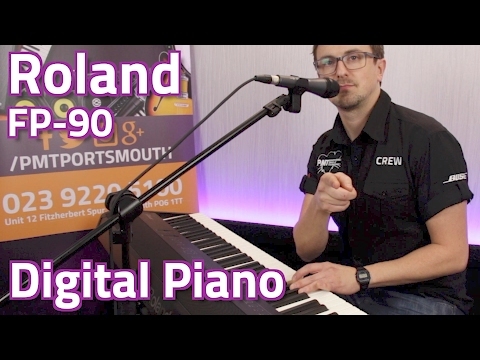 When it comes to Roland digital pianos, people rightly expect to have a great selection of piano sounds and as usual, Roland delivers with the FP-90. Going above and beyond though, the FP-90 also has a fantastic selection of professional grade tones for an assortment of other instruments including electric pianos, strings, organs and synths, giving you all sorts of options for playing pretty much any style of music. 30 user registrations allow you to store your favourite sounds and useful settings like layers and splits for quick recall, so you’re ready to perform straight away – perfect when you like to switch things up during live performances. Dedicated Upper and Lower volume sliders can be found on the panel making it easy to adjust your sound balance on the fly. Furthermore; if you sing while playing the piano, the FP90 has a built-in microphone input with dedicated vocal effects such as compression, doubling and reverb so you get awesome vocal sounds without the need for any extra gear. Built-in Bluetooth wireless support allows you to connect the Roland FP-90 to your smartphone or other Bluetooth devices to stream music through the piano’s powerful speakers – a fantastic way to play along with your favourite songs and backing tracks, or just to listen to and enjoy some tunes for a high-quality audio immersive experience. You can even connect Roland’s free Piano Partner 2 app on your tablet to take things to another level, providing access to an assortment of rhythm accompaniments across a wide range of genres such as pop, jazz and blues – they even follow the chords you’re playing on the FP-90! Learn to play the piano with ease by using the free Piano Partner 2 app from Roland. Specifically designed to encourage a positive learning experience, the Perfect Partner 2 app is the ultimate option for anyone who wants to learn piano in their own time. Available for free on the Apple App Store and Google Play, Piano Partner 2 is compatible with this Roland piano and will guide you on your musical journey and ensure a long and very enjoyable relationship with the piano. Despite being packed with cutting-edge technology and a whole host of convenient, time-saving features that are perfect for the busy musician, the exterior has been designed to be both simple and refined. Also, even though the FP-90 is most definitely a portable piano, it fits right in at home too so you can enjoy it anywhere. If you want to practice late into the night you can even connect your headphones – perfect for private practice when you don’t want to disturb the neighbours. A perfect combination of high quality audio, powerful speakers and portability – the Roland FP-90 digital piano impresses on all fronts. Roland FP-60 vs Roland FP-90 - Which One Is Right For Me?